The apartment we stayed at in Maurach, had fabulous views of the woods and mountains and although it was quite basic, it was perfectly comfortable and very clean and in excellent condition. There were two upstairs and two downstairs apartments, parking and level access round to the door. This had a lip that was too high for my scooter but might well be fine for a wheelchair but whether the apartment would be appropriate would depend on your level of mobility. I had asked if we could borrow a stool to use in the shower cabinet which helped but it was rather a step up to get into the cabinet! In the kitchen area, there was a hob and a combined microwave/grill as well as toaster and coffee maker and enough equipment for making everyday meals. Outside, there was a little terrace (the upstairs apartments had balconies) with chairs and a table. The television had Austrian and German channels only but we managed to get the gist of the weather forecasts! There was a supermarket with bakery in Maurach (MPreiss) and also a bakery delivered bread to the house every day – you put your order and the money in a bag and hung it on the outside light at the front of the house and fresh bread and croissants would be delivered first thing in the morning! As we don’t speak German, the only thing we actually recognised on the price list were ‘buttercroissants’ but you could figure out what were rolls, loaves and large loaves from the weights and prices; it was still something of a lucky dip , but that’s all part of the fun of a holiday abroad! We spent a lot of our time scooting / walking round the nearby lake as there is a path most of the way, suitable for bikes, rollerskates, segues, buggies, you name it: wheel-users’ heaven! It was smoothest near Pertisau, but fine near Buchau and Scholastika on the other side of the lake too and there are plenty of benches along the way. The lake boats are accessible – it was no problem scooting on and off and there was a lift for accessing other floors. The cute little steam train would be too much of a challenge though unless you can climb big steps. 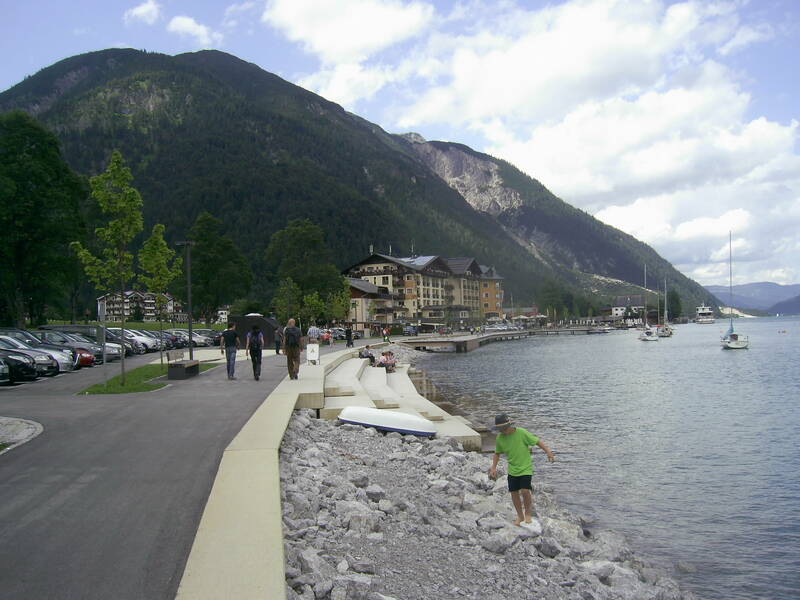 In Pertisau there are shops, hotels, cafés etc some more accessible than others. The Furstenhaus hotel was accessible inside and out and does good cakes. The Post Hotel had at least an accessible terrace but not such good cakes! Round at Achenkirche we lunched at the Fischerwirt Am See which had possibly the nicest accessible loo ever but no way to get into the hotel that didn’t involve a step – perhaps if you stay there they provide a ramp. I really recommend this area for a holiday where you can get great views without driving or sitting on a bench – seeing them while scooting along is much more fun as they constantly change and they really are breathtaking! We stayed one night here before our holiday and left the car while we were away. We had stayed here a year before and been given a room with a bath, despite requesting an accessible one then found out later that they do have rooms with wet-room style bathrooms so we requested one of those. On reaching the room we realised it was one with a bath so we headed back to reception where they were most perplexed as their system said the room did not have a bath. We assured them it did so were allocated another room which did indeed have a wet-room, with seat, grab bars etc although the room still had a very low swivel armchair which looked difficult for anyone to use, never mind someone with restricted mobility! We had eaten here before and were again joined by my brother who lives nearby, so sampled quite a few menu dishes between us but chose from the higher end of the menu as some of the more pubby items had disappointed last time. The food was great if pricey but the service was desperately slow even though the place was not that busy. Breakfast was fine with plenty of choice. Rubbish croissants but good sausages and bacon but apparently tinned mushrooms. We ended up staying the night at the end of our holiday – the plan had been to retrieve the car then head off to a country pub which I had carefully checked out for accessibility and was looking forward to, but the car was making horrendous noises so it was a case of booking in at the Hilton again (we specified the room-number. Bet they don’t get that very often!) and calling the AA. This time we ate at Mr Todiwalah’s Kitchen and oh, boy, was that a good decision! Gorgeous food, excellent staff, good atmosphere and prompt service – the AA fortunately only rang back after we’d finished eating! Car was sorted before check-out time the next day. Their computer system was having problems which had meant not being able to open the min-bar the previous day and meant they couldn’t give us a receipt, but this was made up for by them e-mailing it to us at least three times! The whole hotel is very accessible, as long as you get the right room and I like the way the staff took it in their stride that I was using a scooter. An airport must get all sorts of people all the time, and it should be the norm anyway that people don’t make a difference, but it is still novel enough to be pleasant when it happens! 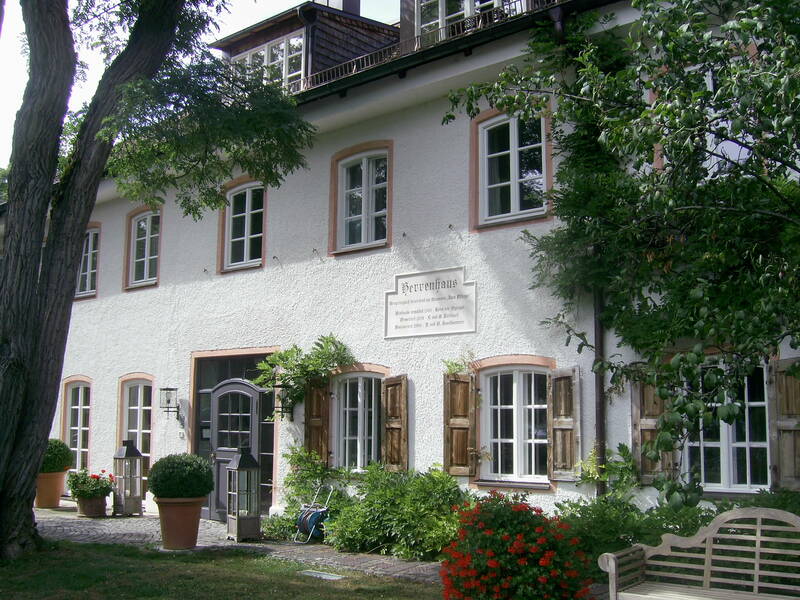 We stayed two nights here before flying home from Munich airport which was only about 45 mins drive away but this place is right in the country and very beautiful. The main house was the home of the family who made Ayingerbrau beers and there is still a brewery you can tour and buy souvenirs of. We stayed in the separate but equally historic guesthouse in an accessible room, although the only difference that I could see was a stool to use in the shower – no grab bars, for example. Also, the toilet was in a separate cubicle which would be impossible to get a wheelchair into. It was a lovely room, on the first floor, (there was a lift) a suite in fact with a sitting room complete with porcelain stove for cold weather visits! I would not put chairs on casters on a wooden floor though as they move too readily! Having arrived at lunch time, we went over to the pub, also run by the hotel and ate in the shade of the trees. The surface was gravel and it was good and spacious. The menu was entirely in German so we struggled a bit (we have Spanish and French but very little German!) and needed the help of the waitress to work things out. Watch out for freshly-grated horseradish – it’s hot! In the evening we ate in the formal restaurant. To get into the main building there was a slight step up – my scooter was fine going down it but not up. There was a set menu which we were happy to go along with although on the second night I asked for an alternative to the cheese plate on offer as dessert that day and was offered various choices. We never did figure out if we could have ordered from an à la carte menu or not but the food was delicious anyway! Breakfast had plenty of choice – hard boiled eggs, lots of ham and cheese, bread, yogurt and fruit. No need for lunch after that but we succumbed to the cake menu! 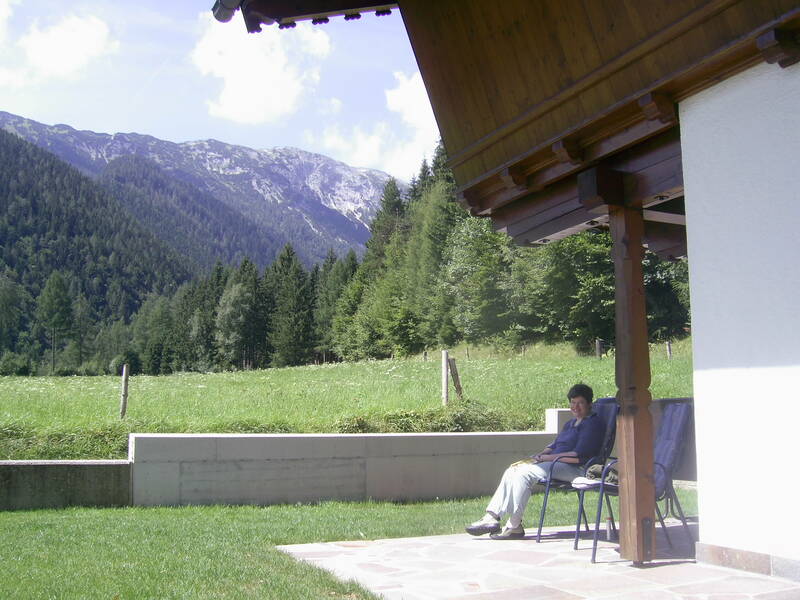 As the weather was good, we sat outside the guesthouse during the day which was lovely – lots of geraniums and shady trees and as it was Sunday, the road was pretty quiet. To get in and out, there are slight jolts in the doorways but nothing too drastic and the cobbled path was a bit rough but again, my scooter, designed for indoor use, really, coped fine. There was a library/sitting room for if the weather was not so good. The staff were great and as a pre-airport stop off I highly recommend this place. It was almost entirely accessible: do ask if you would like further details. Scooters don’t seem very prevalent in the parts of Austria and Germany we were in so mine got plenty of curious looks and even an enquiry as to how it worked and where it was from! 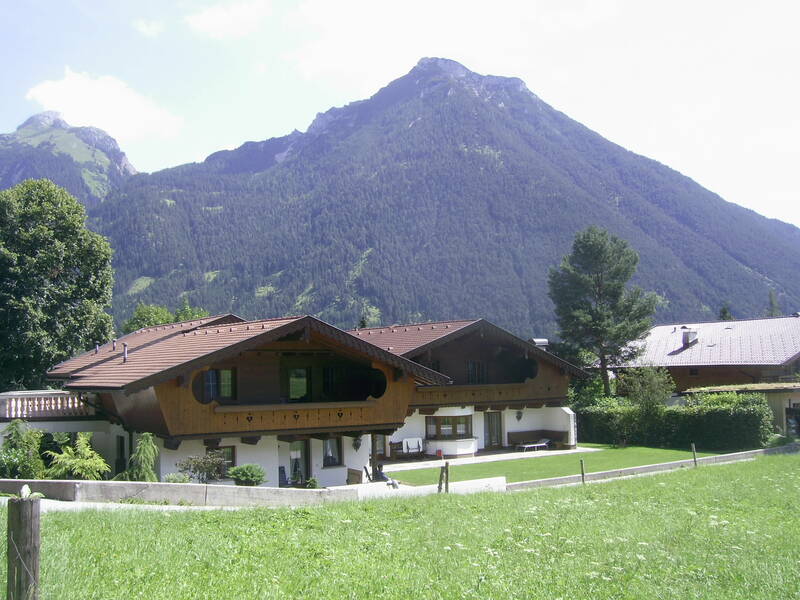 We stayed two nights here after flying into Munich airport on our way to the Achensee, the hotel being 130 kms from the airport. Although it is a Best Western, the atmosphere was entirely that of a family-run hotel, which it is and a very well-run one too, with pleasant, friendly, helpful staff. The restaurant claims to be award-winning and it certainly was very good with nicely-presented national and local specialities, delicious bread and nice wine. The breakfast was also good: you could order various egg dishes as well as helping yourself to lots of different buffet items: cold meat, cheese, croissants, fruit, yogurt etc. We had booked the Alpenrose because it was accessible and it mostly was with a ramp to get into reception and from there you could access the restaurant and breakfast room but the lounge had a step up. To access the terrace where there were more restaurant tables, if you used the ‘outdoor’ route there was a small step which was too much for my scooter but a wheelchair would probably be OK with it. The ‘indoor’ route to the terrace involved two bigger steps. There was a lift (our room was on the first floor) and the room was very spacious with a walk-in shower, plenty of grab bars and a stool to sit on in the shower. There was also an alarm-cord in the bathroom. Not very pre-possessing from the outside, it was a comfortable hotel and very clean, it just needs a little bit of updating: the graphic rose patterned carpet in the bedroom for example and the table-cloths on the terrace tables – lose them and the terrace was lovely! The surrounding mountains are impressive and there was a spectacular storm the second night which meant decamping indoors half-way through our meal! 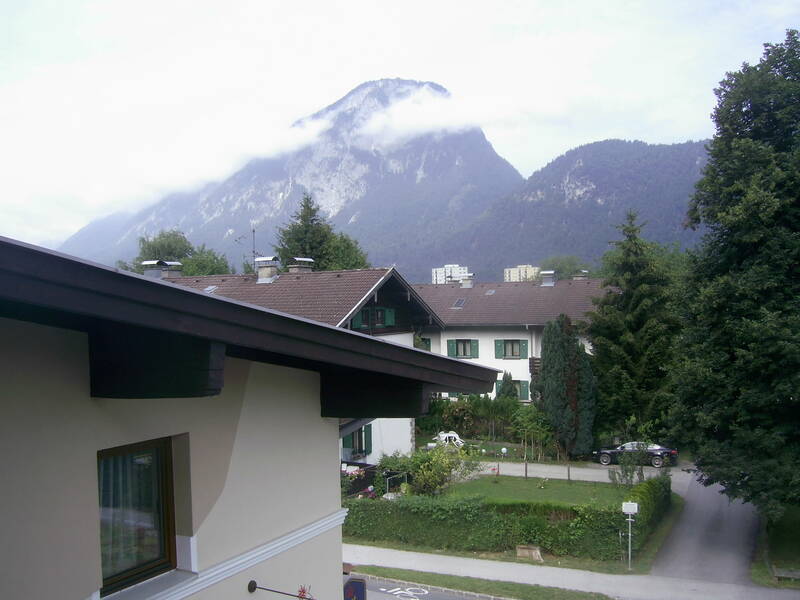 I can’t review Kufstein itself as we just used the hotel for a rest from driving and I would definitely recommend it as a good stopover as well as a base if you did want to explore Kufstein. We’ve just come back from a holiday in Austria and I have discovered that Lake Achensee is wheel-users’ heaven! There is a mainly smooth pathway around most of the lake which was being used by cyclists, rollerbladers, people using segways, people with buggies and wheelchairs and me with my scooter! We didn’t see other scooter-users while we were away, which perhaps explains the interested (even admiring!) looks my scooter got. A business opportunity there for someone! The views around the lake are spectacularly beautiful and there are plenty of cafés with accessible terraces – more information on the area to follow!